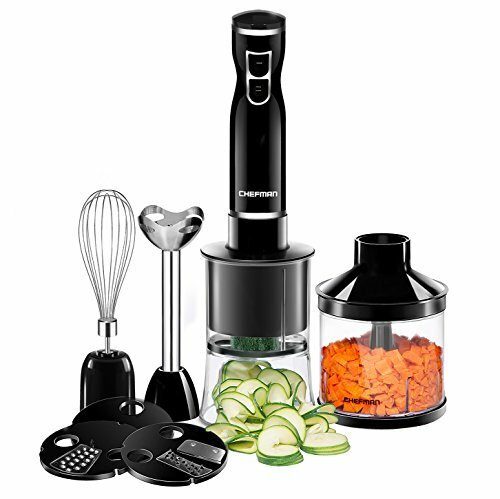 You’ll love the powerful 400 Watt motor on this blender, as well as the ergonomic grip, as you will be able to power through any ingredients without worrying about losing control of the blender or dropping it. Thanks to the variable speed control, as well as the turbo pulse, you’ll find that it is incredibly easy to adjust your blending to the food that you’re making so that you don’t overblend or get left with chunks of food that missed the blades. Not only will you love the chopping blades, but also the whisk attachment and the chopping bowl, as they make it possible to customize your cooking experience each time you go into the kitchen. 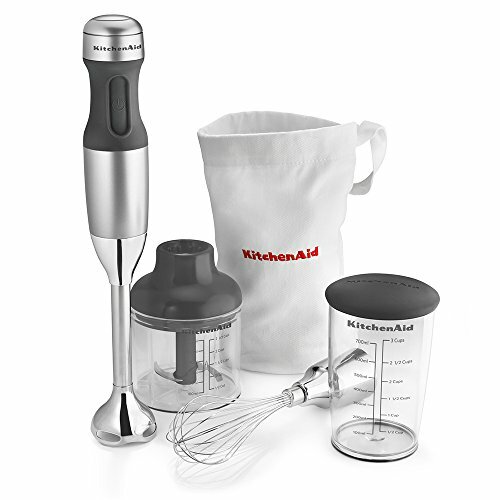 When you buy this powerful immersion blender from KitchenAid you will get all of the attachments that you need to make meal prep and cooking as fast and easy as possible so you can spend less time in the kitchen and more time with your family. You’ll love how easily the attachments switch out, which prevents you from becoming frustrated when trying to cook, and because they are all made of high quality stainless steel, cleaning them is a breeze and you don’t need to worry about them being damaged on accident. Finally, the chopper attachment is designed with a very secure lid that will stay in place no matter what type of hard foods you are processing so that you don’t have to deal with any spills. 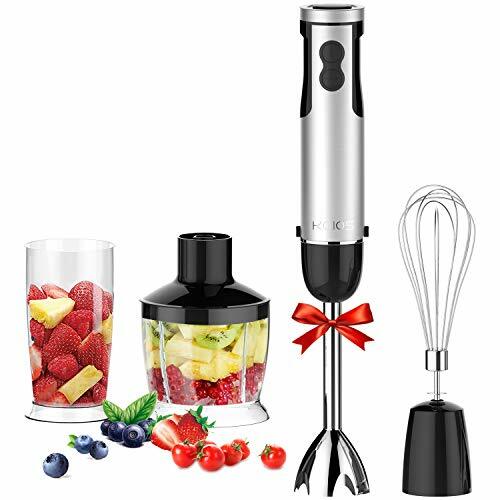 Not only is this blender incredibly attractive, but it is also very powerful and comes with a number of great attachments that make it an ideal appliance to have in any home kitchen. The 500mL food processor is large enough for you to make a batch of salsa, rice cauliflower, or a make a sauce without having to worry about chopping your food in smaller batches. Enjoy how the splash guard keeps food from splattering in your kitchen and reduces the amount of cleanup that you have to do when you are done using this blender and its various attachments. The sharp blades on the food processor are designed to power through all ingredients, even frozen ones. 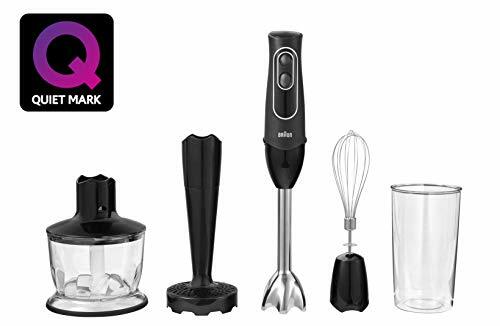 This immersion blender is ideal if you struggle with lifting heavy appliances in the kitchen, as it has been designed to be very lightweight and easy for people to lift and use without any problems. Thanks to the easy click attachments, you can not only quickly and easily attach and detach the whisk, blade, masher, and food processor, but tell when you have due to the audible clicking noise. If you need a little extra power when using this blender, then you can count on the turbo button to give you that extra boost that you may need to easily power through harder or frozen ingredients without any problems. The blades on this blender have been designed to withstand years of use without growing dull, so you never have to worry about whether or not your blender will perform when you need it to. 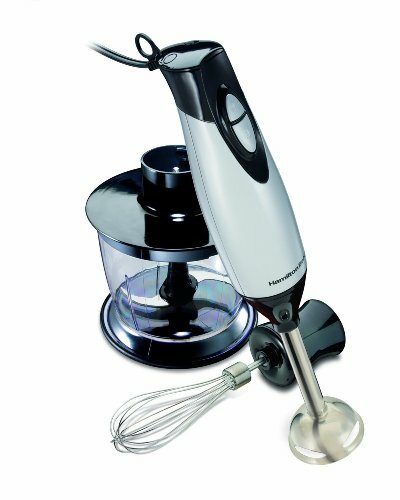 Unlike other immersion blenders that only come with two or three attachments, this blender has the ability to slice, ribbon, grate, spiralize, whisk, blend, and more thanks to the multiple discs that can be used in the chopper attachment. This means that you can get rid of a few larger kitchen appliances and save some space in your kitchen. With a 300 Watt motor, this blender is able to power through most foods in the kitchen without any problem, and thanks to the two speeds, you can easily customize your blending or chopping experience. The food processor discs are very easy to change out and to wash, and due to their smaller size, they are also easy to store. The brushed stainless steel on the housing of this immersion blender isn’t just attractive, it is also very easy to clean so that you don’t have to worry about the appearance of your blender or whether or not you will have to deal with old food sticking to it. Rely on the push button for continual blending, chopping, or whisking, or use the pulse to help break up very hard food into smaller pieces. The two speeds on this immersion blender will give you all of the power and control that you need when facing a lot of meal prep, and thanks to the comfort grip handle, you don’t have to worry about your hands getting tired when using it. 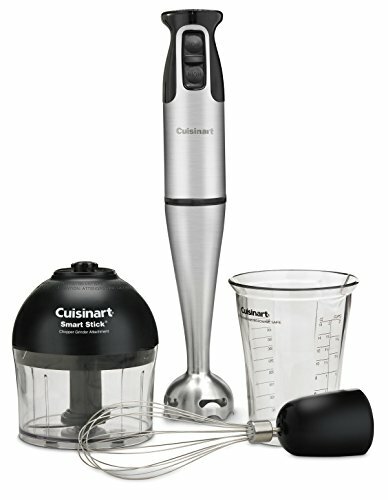 This means that this blender is ideal for anyone who struggles with hand weakness or pain. 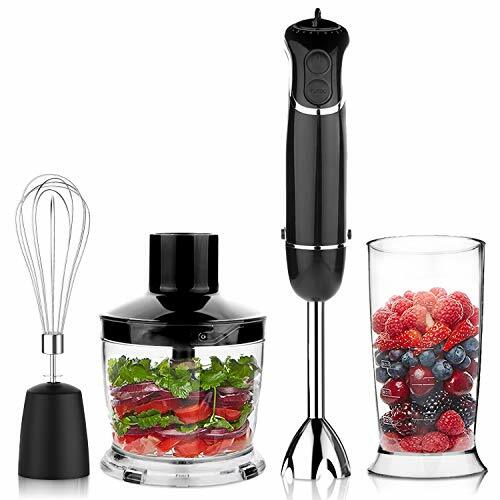 This two speed blender makes blending, chopping, and whisking faster and easier than ever before and ensures that cleaning up is a breeze since all of the attachments are dishwasher safe and don’t need to be washed by hand. The blades are strong enough that you can easily chop nuts in the food processor without worrying about damaging or chipping the blades, and since it is a three cup container, you can easily prep a lot of food at once without having to take time to empty it out on a regular basis, which can waste time and slow down how quickly you are able to cook. Thanks to the small size of this immersion blender, you can easily fit it into a drawer in your kitchen, which makes it ideal for anyone who has a small kitchen without a lot of spare space.